Will Dyson., Australia at war: a winter record , 'Tunnellers under German Territory', London, 1918, 28, 29 (illus.). 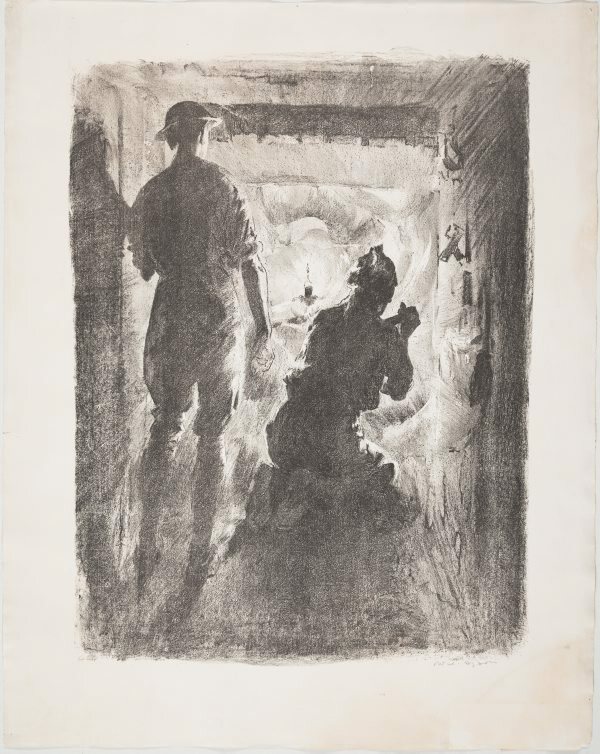 Includes an illustration of the original drawing that was to lead to this lithograph as well as the following excerpt by Dyson: "Tunnellers under German Territory. “The tunneller’s activity is only heard of when the world is deafened by the blowing of a mine that he has prepared through months of silent, modest and retiring labour; labour that in its nature is coy and shy of observation. A form of warfare with its stratagems and incredible counter stratagems . . . for which the Australian miner has peculiar advantages . . . . to these strange places he brings all that was characteristic of him in the Lady Berry at home . . . . “It was our tunnellers who prepared a little show which an English battalion carried out, and the night of the touch off a battalion commander said to a tunnelling officer, ‘I think I should tell you that I am given to understand that some of your men are going to attempt to go over with us to-night.’ Which it is understood that the tunnellers did contrive to do, for the next day a tunneller showed ‘P——’ a fine Fritz watch. ‘You don’t get them tunnelling, sir,’ he said. ‘The infantry will do me after this!’”"
Ross McMullin, Will Dyson: Australia's radical genius , 'Chapter 3: 'THE WAR HAS ALTERED HIM A LOT' Holocaust 1914-1918', Australia, 2006, 171-173. Ross McMullin, Will Dyson: Cartoonist, etcher and Australia's finest war artist , 'Chapter 3: THE GREAT WAR', Australia, 1984, 139. General reference to the activities of tunnellers in the Nieuport region.